Be honest, since a childhood, every girl dreams of a princess image at least one time in a life. We know how to embody it in a reality. Why wouldn’t you try on mermaid wedding dresses? It is also called “Fish” dress, because of its resembling of a fishy tail. “Mermaid” wedding dress is completely coating the bodice tight tapering on a knee. Sometimes, designers adore dedicating to themselves creations of one or another fashion model. The same story happened to a “Mermaid” fashion model. Telling a true, this style came to us from a Victorian period. From the start, it was a casual dress. With a pace of time, closer to a 20th century time, they turned to evening dresses. There were mermaid fashion models either, but for that time they didn’t call like that. During 70s-90s, the most famous were pant-skirts and pant-skirts with a trail. And you know what? They are nothing else than “Mermaid” gowns and “Mermaid” gowns with a trail! Modelers propose a large number of variants to choose among which any bride can pick out something suitable exactly for her. Diversities in models split into two groups: diversification in a gown or in a bust. This style is so majestic fitting along figures. 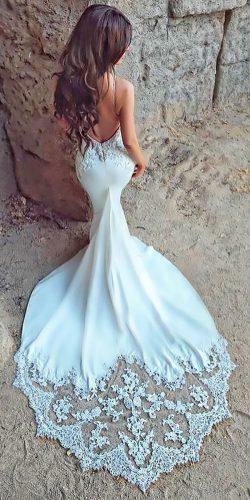 If you like mystic models of mermaids, then compare mermaid vs trumpet wedding dress. They resemble each other and take best traits for their fashions. Whether you will have an entirely open up part or you are fond of little straps, choose among popular solutions. “Fish” dress can have a completely open bust, either it has shoulder straps with various width. Still wearing such models match ideally to warm seasons. Another beauteous form reassembling mermaids is a trumpet wedding dress. It will serve to your image a splendid breeziness and romanticism. 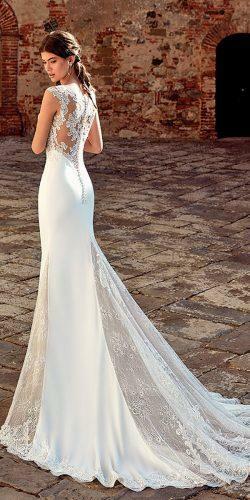 Whereas you are marrying in a warm season, try a beautiful option with an open-back dress for a wedding. 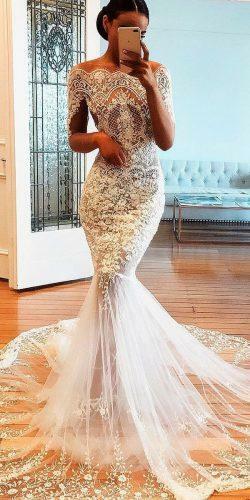 Amazing mermaid wedding dress will look gorgeously on girls with a straight posture. If you’d like to accentuate on this stunning part of a body, you have to be sure that an open back seems wonderful. After that, there are lots of splendid options to award it with other designing elements. You can meet the mermaid models with a poufy gown often. In that layout, you have a cropped gown with a line that can be straight or figure. 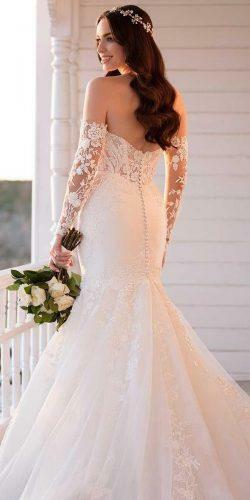 Trying mermaid gown wedding dresses, you often meet different facets for an upper and a lower body. More splendor variants of a “Fish” dress with a tail are a cropped or whole-stone skirts. Materials for upwards and downwards parts in mermaid wedding dresses can be similar or diverse as well. Nevertheless, a tailed variant under all its beauty isn’t convenient for a walking. Helping hand, in that case, comes from the side of transformer “mermaid” models, where a gown removes easily. You can switch it off at any moment, remaining just in mermaid fit dress. “Fishes” with sleeves are tremendously actual in that season. 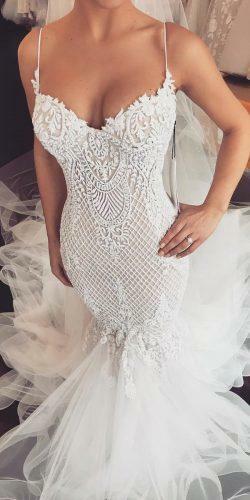 Counting that mermaid wedding dresses have a huge amount of variations with sleeves. They all can be in entirely different forms, from long-sleeves, three-quarter sleeves, elbow-sleeves, short-sleeves to puffed sleeves, flared sleeves or raglan and cut sleeves. Take the facet like for sewing of the dress itself, or choose a half-transparent or lacy variants. 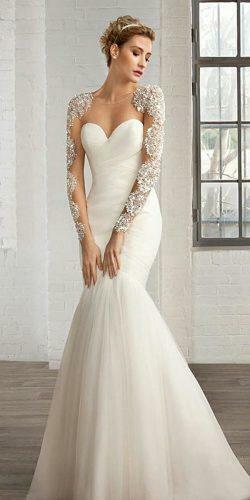 You can find more details on types of sleeves for wedding dresses in our other articles. 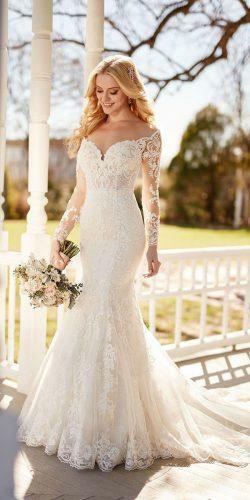 Graceful lacy in mermaid wedding dresses is truly amazing. By wearing such dress type on your distinguished celebration, you’ll enchant all guests with its grace. Ravishing posture in seductive silhouettes conjoins elegantly with soft and tender materials. You will have a delight outlook even in closed dresses with flowing materials. Lace looks superior in dress hemlines or in a trimming of tails. It suits for gentle and transparent facets either. Do you know what is your figure type? You may check it in our test. What a terrible fallacy to think that it is only for slim ladies. For true, this dress hides a variety of tips and tricks to match the dress almost to every figure. Read the following ones to clarify that “Mermaid” dress is not only for thin girls. Brides with a short height should to pay attention on models with open shoulders and slight straps. Don’t forget to put on high heels. In the case when you cannot boast with a full breast, then pick out V-cut or sweetheart necklines. In order to gain an additional volume, you can involve drapers, rushing or hem flounce. For possessors of the big breast, your ideal option will be a dress with wide straps or a cut. A broad contrasting belt is a universal detail suiting everybody. If you have some flaws on a waist place it around. Girls with broad shoulders will look effective wearing tight sleeves and dress gowns tapering from a hip. 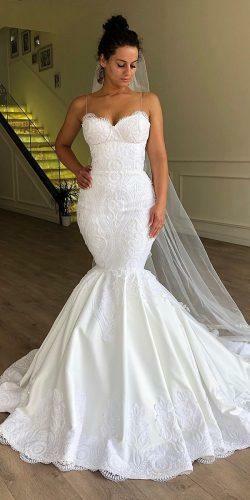 Curved hips will hide diagonal drapes in sweetheart mermaid wedding dresses. For plump girls, this model will suit ideally. 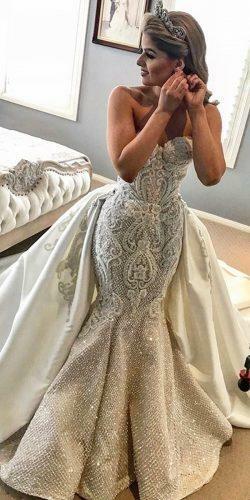 Modified mermaid wedding dress has many options to hide a drawback part. The main point for a proportional figure is not really notable belly. In this case, the cut-in-a-one gown is a great variant. The better if mermaid wedding skirt won’t be too much opulent. Who doesn’t it suit to? You should always choose a dress in your size and it must cover the figure. Because if too tight dress emphasizes limitations, an oversize can be looking fun. It is easy to check which dress compiles with you in the best possible way. Trying mermaid wedding dresses on, walk around a wedding salon. If you are feeling that it is so tight that you need to slow down a width space, that it is yours. From the other side, it doesn’t have to chain apace. “Tail” of the dress should start not lower than from knees, and it can be even higher. On the contrary, you just couldn’t walk in it. And you will have to move a lot and even to climb on stairs. In any case, check if you can make it in advance. 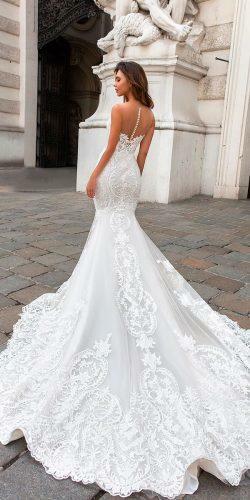 Look for startling samples among lace trumpet wedding dresses. Despite that veil is one of the essential wedding accessories, it hasn’t to be in the middle of attention in a wedding garment. This elegant model matches equally well with a light and luxurious veil. Short and transparent or long and multilayered voile will match to this model. 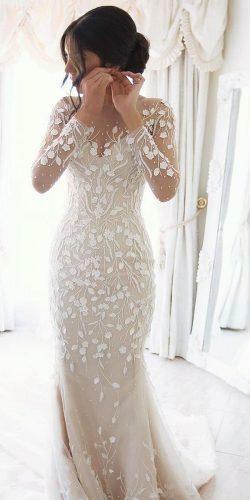 But for the case of lace in A-line wedding dresses, don’t use it in a bridal veil decoration. The main point is not to overwhelm elegant silhouette of A-line wedding dress. Here is another rule: the richer and brighter are the dress trims, the more constrained headdress should be. Controversy, the richer headwear requires the lusher garnish and furnishing. Short haircuts will suit to the image as well. Selecting a makeup, do not forget that mermaid wedding dresses imply light and romantic look. Then, a win-win variant will be a classic makeup with a prevalence of gentle and natural tints. But a brisk evening makeup won’t suit the image as it is too bright. You can wear pink mermaid wedding dress which goes effectively with light makeup. Choosing sparkly mermaid wedding dresses, remember, that bride on a wedding – is a center of common attention. Take care of your garb and accessories as they must to be stylish, beautiful and matching. But also, it should correspond with an appearance and a size. Overall, it is important to feel comfortable in a beautiful wedding garment. But the main pledge of effectiveness is a confidence that you emit.